Avery Jenkins has been carrying discs around for a long time. It would be next to impossible to calculate how many discs he’s carried for how many miles, but a safe guess would probably start at six figures. In May of 2010 however, carrying those discs got a lot easier for him. It was just before the Master’s Cup National Tour event in Santa Cruz when Avery and his sister Valarie were able to test out the Grip EQ Tour Bag on the professional level. Right away he was impressed; it was clearly not just a backpack that could hold discs- it was a design built from the ground up to cater to the specific needs of a disc golfer. The actual design was a bit of a collaboration process with Grip EQ’s front man, Justin Atwater-Taylor, at the helm. He spent years working on the whole concept, and another year working out the prototypes with Avery (as well as Valarie Jenkins and Nate Doss), in order to dial in the most durable well designed product possible. In fact, this prototype process, where the design was still embracing changes and improvements, is the main reason Avery Jenkins hasn’t been carrying the same single bag around since 2010. Avery had to swap out his personal models for analysis and development periodically, and he also gave a couple away so other players could use them (*You can even bid on one of his personal Grip Bags here on eBay until March 28th). It seemed only natural to catch up with Avery himself and ask him every question we could think of. This was a perfect way to get an insider’s look at the Grip EQ Tour Bag. DGS- Out of curiousity, since you were involved pretty early on, did you have specific input on the actual design with Justin Atwater-Taylor? A- I intially designed this bag years ago as a project for my Industrial Design Thesis. J@water stole my idea and I’m still pretty pissed about it, but he added some great additions since then. So I’m cool with it now. Really though, he designed it based on years of research, which included interviews with and observations of casual and professional golfers from all over the place. Justin had been working on his research and branding for several years in school when he approached us about an idea to produce a line of totally new disc golf bags that would be more comfortable, intuitive, and stylish than anything we had seen before. He was talking about empowering the sport and improving the overall experience of the game, which was a way of talking that I hadn’t heard out of any other gear designer in the industry. I was pretty interested in the concept and believed that it was something that was very necessary for the market. But during the development phase on tour we gave him a lot of feedback that he then translated into design modifications. Justin and I traveled together for a good portion of the 2009 Tournament Season and collaborated on ideas for what would make for a complete disc golf bag. He went into his studio over that winter and came out with not just the coolest bag, but the coolest product I’ve ever seen offered to the disc golf market! But even after having talked about it so much over the years I was still blown away when I opened that first box! It was like nothing I could have ever imagined! I have always believed in Justin’s vision, but since he has put out this first tour bag I have only become more stoked that he will continue to produce incredible disc golf bags and other disc golf related gear in the future. DGS- Do you use a caddy? If so, do you use one more or less with this bag? A- I don’t have a personal, official caddy because I travel each and every weekend. But when I do, I usually only have a caddy who I know well from my days on tour. If someone requests to caddy for me I like to meet them first and get to know them before letting them carry my bag. Tournament golf is personal for me, and because of the focus required I want someone that I know. I like to talk to my caddy during the rounds but not be distracted by someone I’m unfamiliar with. The several caddies that have carried my Grip EQ bag have said that it was by far the most comfortable disc golf bag they have ever carried. I had a friend of mine carry the bag for a 4+ hour round and he never set the bag down once. He also commented on the bag by saying that it conformed to his back so well that it barely felt like he was carrying a bag at all. DGS- Can you reach that top putter pocket without taking the bag off? To tap out an easy putt? A- The Quiver-Style putter pocket located on the top of the bag is an incredible feature that was specifically designed for the exact reason to have easy access to your putters. It allows for access to them over your shoulder for tap-out putts, and enables you to put them back in the bag with ease. It also holds them up at thigh level when the bag is on the ground so they are easy to grab when you are standing around the green. The retractable pocket allows you to elevate the putters a couple of inches out of the pocket for easy access during the round. You can also unsnap the strap to depress the pocket, which drops the putters into the main compartment of the bag to be zipped in for convenient travel and protection for your putters. The addition of this feature is revolutionary in the design of disc golf bags as you will probably see a lot of other bag companies out there try to copy this element. DGS- How is this bag different from other backpack style DG bags? 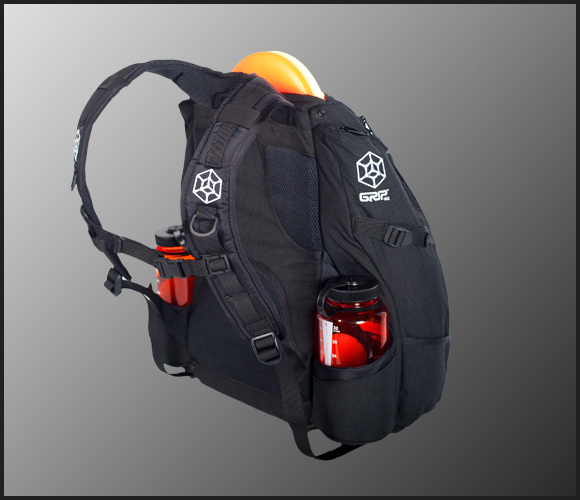 A- There are several other backpack style disc golf bags currently out there on the market but very few of them have essential features like a reinforced compartment structure, comfortable backpack straps and extra storage space. The difference is that the Grip Equipment Tour bag has all of those features in one bag including extras such as the retractable putter pocket, detachable rain fly and super tough nylon construction. The Grip EQ spent six years of research in developing this bag and has taken the player’s needs into account in the actual design in a way that no one else could. Justin went deeper than asking golfers what they wanted in a bag and asked specific questions that I had never heard before to test ideas he had about functionality and design. He really did his homework to get into the mind of the golfer to design new and innovative gear that they didn’t even realize they could have. DGS- How effective is the rain-fly? A- The fitted rip-stop nylon rain fly is one of the best features of the bag because keeping your discs dry during a round is always the main objective. It covers the entire bag, and not only does it keep your discs dry but it keeps the entire contents of the bag dry as well. It’s very accessible and easy to fasten to the bag at anytime. There is nothing worse than having your bag and discs get soaked during a round in the rain; especially when it can ultimately effect your score. I have used other bags that had a rain fly that was part of the bag but was very ineffective at keeping my discs dry. Many other bags have access to the discs from the top of the bag, which also keeps them very exposed to rain and other debris falling into the bag. 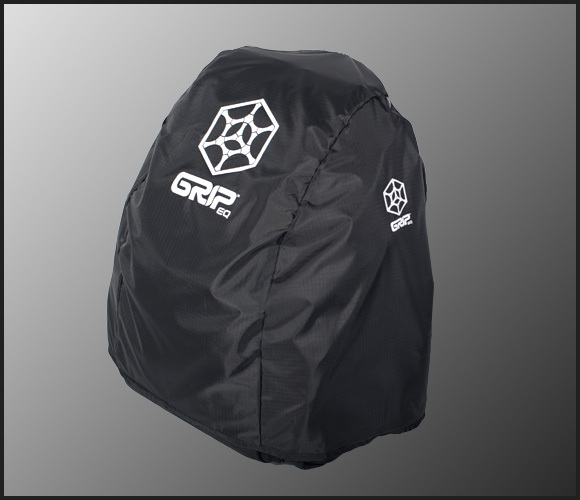 The Grip EQ positioned access to the discs from the side of the bag, which decreases susceptibility to rain even without the rain fly, but with the rain fly the discs stay completely dry. You can also use the rain fly to continue to shelter the discs while viewing and accessing them. I remember doing some field testing on the bags the very next weekend after receiving them and what better place to test than rainy Oregon at the Beaver State Fling. We used them in a long 4 hour round while getting rain dumped on us the whole time, then J@water set his bag out in the wet grass in an open field for another hour. When we brought the bag back in, we checked the discs and gear and they were absolutely bone dry. The next day was much nicer but everyone else still had wet bags and gear from the day before… and we were out there with dry equipment on our backs! DGS- What’s your favorite feature of the Grip EQ? A- Well there are many key features that I really like about this bag but I think that my favorite is the structure and look of the bag. It has a very sleek, compact design that is very functional, providing a comfortable fit and carrying everything that a disc golfer needs on the disc golf course. I also really like the additional storage pockets to keep your cell phone and wallet elevated off the ground, protected from the possibility of getting wet or damaged due to unnecessary impact. Of course the drop down putter pocket and the detachable rain fly are very critical functions as well, making this bag different from every other bag on the market. DGS- Did you notice a difference with overall fatigue (as in LESS) with this bag over a long day at a tournament? The symmetric design conforms to your body as it rests against your back and moved with you as you walk down the fairway. I am also able to hike up hills with ease, not worrying about the bag bouncing and straining on my back. It makes for an excellent bag to get you through a long day at the course or a long weekend at a disc golf tournament. DGS- Do you use the chest strap/buckle? A- I personally don’t use the chest strap all that often for the fact that I am constantly taking the bag off and on throughout the round between shots. I usually only use it to lock down the chest strap when hiking up and down hills during the round or when I plan on keeping the bag on for a while like on walks for bike rides to the course. Oh and that reminds me that I’ve never had a bag ride so securely and comfortably when I bike to the course! I have seen lots of other players using the chest straps to increase the fit in the shoulder area on those players with smaller body types. I think it’s an important feature that any backpack style bag should have especially to provide better support and fit. DGS- Do you have anything you’d change about the bag? Or any complaints? A- The Grip EQ bag is by far the best disc golf bag that I have ever used, from it’s comfortable fit to it’s solid structure and design. You can tell that there has been a lot of research and thought put into this bag before sending it to final production. 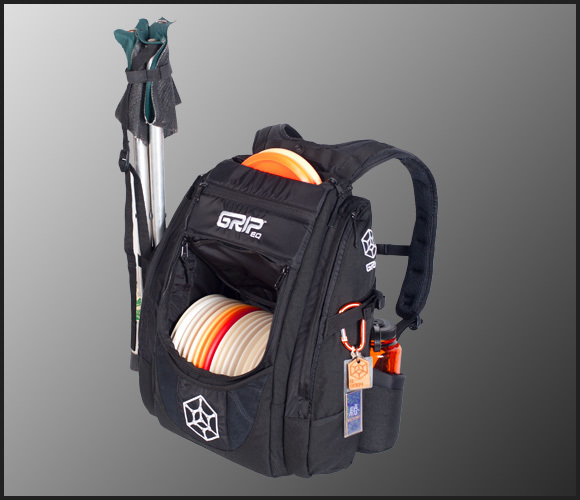 Personally, I wish that the Grip EQ bag could fit more discs in it, but I totally understand what makes this bag so comfortable and easy to carry. So there are trade-offs with the size of the bag and the design. It’s that size for a reason which makes it conform better to your body. So I look forward to a future Grip EQ design that allows for me to carry more discs. DGS- Did the Grip EQ have any direct impact on your disc golf game in 2011? A- It has definitely increased my stamina on the course by the reducing fatigue due to the lightweight ergonomic design that conforms to fit on your back properly. It’s also a comfortable bag that doesn’t swing and shift on your back while you walk to your shot or the next tee. This bag alone gives me an advantage during a rainy tournament just for the fact that I know that my discs will be dry the entire round. My dry discs provide more grip and better control when throwing which has definitely saved me strokes throughout the long disc golf season. DGS- Are there any specific instances or stories that come to mind when you reflect on your year and your choice of the Grip EQ bag? A- I remember the day when the prototype Grip bags first arrived at our place in Santa Cruz, Justin could barely contain his excitement as the idea and vision came to fruition. Val, Nate and I were excited as well, as we couldn’t wait to go play a round and try them out on the disc golf course. We headed up to De Laveaga Disc Golf Course for the very first round with the bags, taking a bunch of promo pictures and testing all of the functions of the bag. Although there have been several modifications to the bags since the first prototypes produced, the overall durable structure and symmetric balance of the bag has never been compromised. As the Grip EQ bag will only continue to improve, become lighter weight, more durable and provide more overall comfort in years to come. For any additional information, pictures, and style options please visit the Grip EQ website. This entry was posted in Equipment and Gear, Touring Pros and tagged avery, bag, comprehensive, disc, eq, golf, grip, jenkins, review, tour. Bookmark the permalink. Pingback: Poll 4: What kind of disc golf bag do you use?